Science tells us that if you suffer from a mental illness you have fallen victim to the unfortunate case of a “chemical imbalance” in the brain. 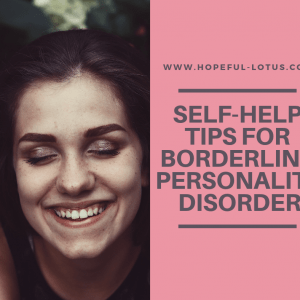 The underlying causes aren’t addressed and you’re shoved on an antidepressant, otherwise known as a Selective Serotonin Reuptake Inhibitor (SSRI). But what if that’s not the case? What if the cause of your mental difficulties is actually the result of a problem in your gut? Let’s talk about the Gut Brain Connection. This post contains affiliate links. If you decide to make a purchase through one of these links, I will earn a small commission at no extra cost to you. I do not promote anything I do not wholeheartedly believe in or stand behind. You can click here to read my full affiliate disclosure. The gut and the brain are so connected that the gut has even been nicknamed “the second brain”. Don’t believe it? You only have to look at the “butterflies” phenomenon to realise that our psychology has an affect on our physiology, or our guts more specifically. And it’s not just a one-way street. Scientists use the phrase “gut-brain axis” to describe the two-way communication between your brain and your gut. Neurotransmitters travel to and from the brain and the gut via the vagus nerve, which is the longest nerve in the human body. The vagus nerve acts a bit like a string telephone to communicate between the two brains. Pretty cool, huh? If that wasn’t enough, your gut even has it’s very own nervous system, called the Enteric Nervous System, which acts according to the messages it receives. There are literally trillions of bacteria that live in your gut, known as your gut microbiome. What many people don’t realise is that our microbiome affects so many functions in our bodies, from our immune systems to our metabolism. When our microbiome is in balance – full of rich and diverse microbiota – we are better able to fight off chronic diseases and have all round good health. But when it’s out of balance, otherwise known as dysbiosis, we develop chronic diseases such as diabetes, asthma and inflammatory disorders. As well as (you guessed it) mental illnesses! What’s shocking is that so many of us are experiencing gut dysbiosis as we speak, simply as the result of the western lifestyle. We make crappy food choices, are under high stress, take antibiotics willy nilly and use pesticides on everything. Is it any wonder our systems are out of whack?! Stomach problems after antibiotics aren’t uncommon, and that’s because antibiotics not only wipe out the bad bacteria, but all of the good bacteria too. Studies have shown that even after a 6 month recovery after antibiotics, healthy participants were still missing nine of their common beneficial bacteria and a few new non-desirable bacteria had colonized the gut. And this was only after one round of antibiotic use for 4 days. You can only imagine what the result of antibiotic overuse would be! Glyphosate is the world’s most widely used herbicide – if you buy your fruit and veg from the supermarket, you are more than likely ingesting Glyphosate. But the problem is Glyphosate kills gut bacteria. Studies in chickens found that beneficial bacteria was more susceptible to Glyphosate, while harmful bacteria was more resistant. This means that pesticides contribute to the growing prevalence of gut imbalances, even when used at “safe levels”. What’s more, studies have linked glyphosate as a causal factor in the rise of gluten intolerance and celiac disease. The link between stress and gut health is a strong one. When we’re stressed, we produce adrenaline and cortisol, which put our bodies into the fight or flight response. When the body is in this state, it diverts blood flow away from the gastrointestinal tract. Repeatedly diverting blood from the GI tract can cause the gut wall to break down, which is what we call a “leaky gut”. Stress chemicals also suppress the immune system, so that it cannot fight off the unfriendly bacteria in our microbiome. This means that when we are under prolonged stress, we are not only damaging our gut linings, but adding to the imbalance of good and bad bacteria in our guts. This is a recipe for illnesses, both physical and mental. How is gut health linked to mental health? If we return to the theory that a lack of serotonin leads to mental illnesses such as depression and anxiety, you might be surprised to learn that 95% of the serotonin in our bodies is actually produced in the gut. Yep, all this time we’ve thought that our brains were the ones that couldn’t make enough serotonin to keep us happy. But now it’s clear that our guts may be the true culprit. Our friendly bacterias are the ones that produce B vitamins, amino acids and short-chain fatty acids to make serotonin and dopamine. So, you guessed it, not enough healthy bacteria = not enough serotonin. Leaky gut is when the cells lining your gut aren’t stuck together as tightly as they’re supposed to be. This results in the leakage of proteins, viruses and bacteria to leak out of the GI tract and into the bloodstream, where they can cross the blood brain barrier and enter the brain. Leaky gut syndrome can cause the enteric nervous system and the central nervous system to have a dysfunctional conversation. What does this mean for mental illnesses such as depression? Well, a marker for leaky gut called Lipopolysaccharides (LPS) is very strongly correlated with a diagnosis of major depressive disorder. You can learn more about leaky gut and depression in the video below. As touched on in the video above, research on gut health and depression suggests that inflammation as the result of gut dysbiosis could be what is causing your mental health troubles. Studies have shown that markers of inflammation are elevated in depressed patients. Not only this, but using anti-inflammatory treatments can effectively resolve depression, without the use of SSRIs. This is clear evidence of the link between inflammation and depression, as well as a range of other conditions such as anxiety, alzheimers and autism. Looking at cases of irritable bowel syndrome (IBS) can tell us a lot about the gut brain connection. IBS is the name for a collection of uncomfortable gut related symptoms such as bloating, cramping, diarrhea and/or constipation. The Anxiety and Depression Association of America estimates that at least half, and as many as 90%, of IBS sufferers also suffer from anxiety and/or depression. Now, this may be the case of the chicken and the egg – it’s hard to tell what came first in cases of co-occurring IBS and mental illness. Since symptoms of IBS can be very debilitating, they can definitely cause low mood and anxiety, which I have experienced firsthand. But I am a firm believer that the story goes both ways. IBS tends to flare up in times of stress and some doctors may even treat IBS with antidepressants. 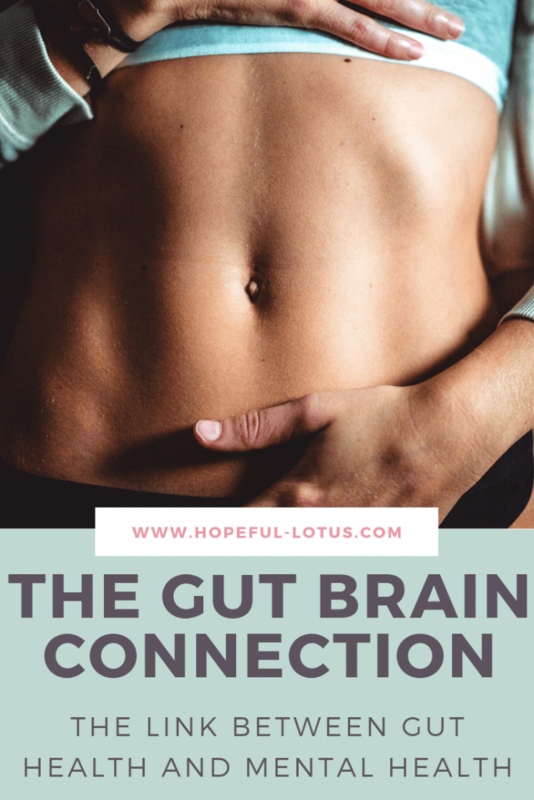 I feel very passionately about the gut brain connection because I have felt its effects firsthand. 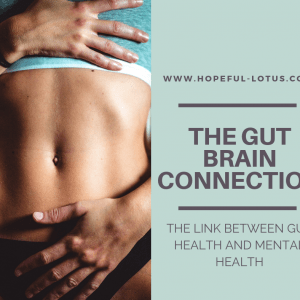 I want to tell you a bit about my ongoing story to demonstrate just how closely your gut and mental health are related. 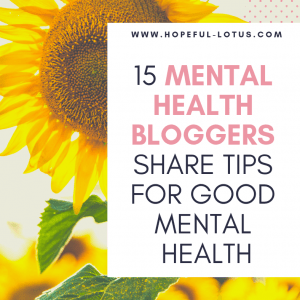 I have suffered from mental health issues for my entire life, including anxiety. Perhaps not coincidentally, I have also suffered from gastrointestinal issues for most of my life. I have always observed a link between the two. When my gastrointestinal issues flared up (stomach noises, cramping, diarrhea) I would feel incredibly anxious. If I felt anxious, my gastrointestinal issues would flare up without fail. Although I observed this connection myself, most doctors I saw were oblivious to it. I even asked about the connection and was told this was a myth. Wow! During my time at university my gastrointestinal problems got so bad to the point where I was experiencing diarrhea every day and was constantly taking Imodium due to my anxiety about having an accident if I left the house. It was exhausting and debilitating and was really bringing me down. 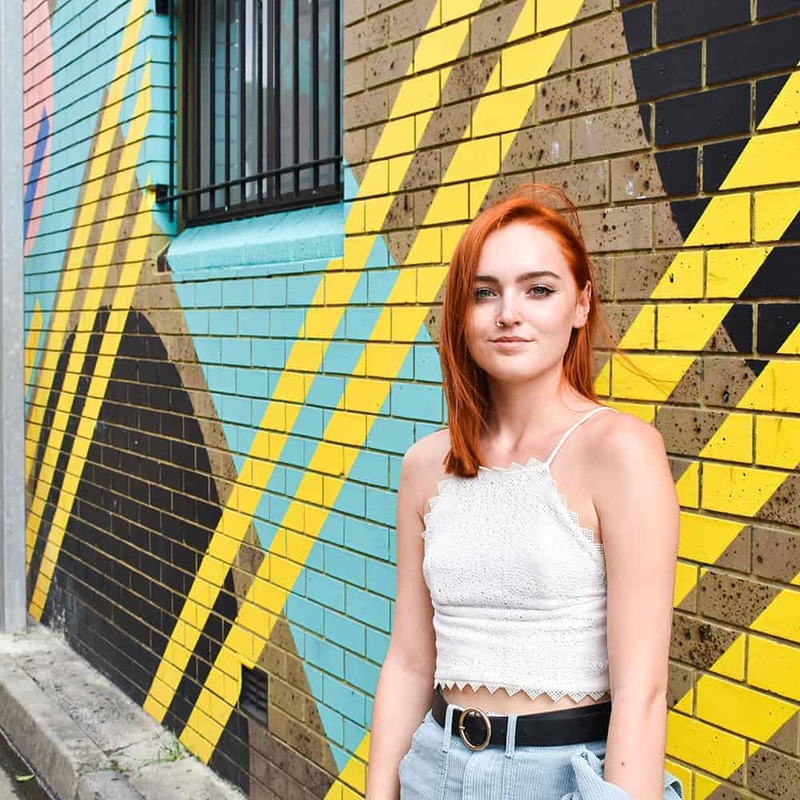 I visited my doctor and gave a stool sample which revealed high levels of an inflammatory marker, which suggested I might be suffering from an inflammatory bowel disease such as Crohns or Colitis. But a colonoscopy came back negative and I was diagnosed with irritable bowel syndrome. That was it. No really, I was diagnosed with IBS and sent on my way. I was told there was nothing they could do. Nothing was done to address the fact that there was chronic inflammation in my gut. This clearly wasn’t normal but it was dismissed as if it was nothing. So I did what any person who feels let down by their doctor does; I turned to Google. I did my research and was concerned that I might be suffering from dysbiosis and leaky gut. I took a cocktail of different herbs and cut out inflammatory foods like gluten and dairy. My gut improved somewhat but it was still far from healthy. I believe that my gut couldn’t heal to its full potential because I hadn’t addressed the anxiety and stress I was experiencing. But when I was put on a new SSRI medication by my GP (Sertraline), not only did my anxiety decrease but my gut health improved tenfold. After I started taking the SSRI, my gut began to calm down and I was no longer experiencing chronic diarrhea. This was a life changing result that I hadn’t even expected. I have since come off antidepressant medication. As a result I have noticed my gut health has gradually worsened and I suspect there is a lot more inflammation in my system which is revealing itself in symptoms such as spots on my face. My mental health has also been on a decline alongside this. So the link between your gut health and mental health couldn’t be more clear. To heal the mind, we have to start with the gut. And to heal the gut, we have to calm the mind. It’s a complex cycle that’s hard to get a grip on, but it can be done! 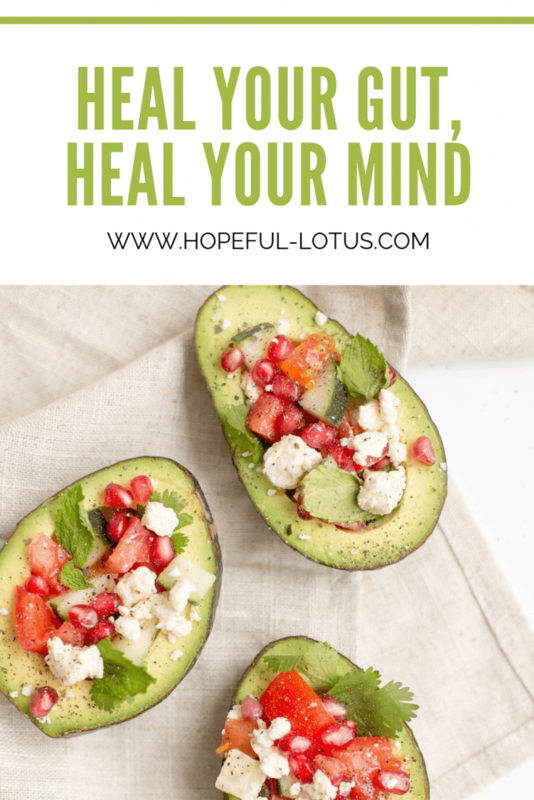 Having reflected on my own experience of the brain gut connection, my intention going forward is to heal both my gut and improve my mental state by using natural methods of healing. If you want to join me, these are the steps to heal the gut and the mind naturally and simultaneously. Processed foods are full of refined sugar and carbohydrates, which are bad news for gut health. Bad bacteria feeds off excess sugar, which can allow it to take hold and overrule good bacteria. Avoid processed foods, and focus on nutritious whole foods instead. As a general rule of thumb, if it has over 5 ingredients on the list then stay away! No pesticides are used in the production of organic food. Since we want to completely avoid pesticides for gut health, organic is the way forward. It may be a little more expensive, but think of the money you’ll save on medical bills! Fermented foods are full of healthy probiotics, which nourish the gut and can help heal dysbiosis. Some of my favourite fermented foods to consume for gut health are kombucha, sauerkraut and tempeh. You can also include yoghurt, kefir, miso, and kimchi. Gone are the days where grains such as wheat were soaked, sprouted and soured to improve nutrition and digestion. Mass production means that the products we consume from gluten containing grains are difficult to digest and inflammatory to the body. Even if you don’t consider yourself to have a gluten intolerance, consuming it may not be doing your gut or brain any favours behind the scenes. Cut it out! One of the reasons our guts are so inflamed is due to our imbalance of omega 3 to omega 6s. The standard american diet consists of so many oils, which are high in inflammation raising omega 6s, and not enough omega 3s, which lower inflammation. Focus on getting your ratio back in balance by including more fish in your diet or vegan omega 3 alternatives such as chia seeds and flax seeds. While you’re at it, cut back on all the unnecessary oils you are consuming. 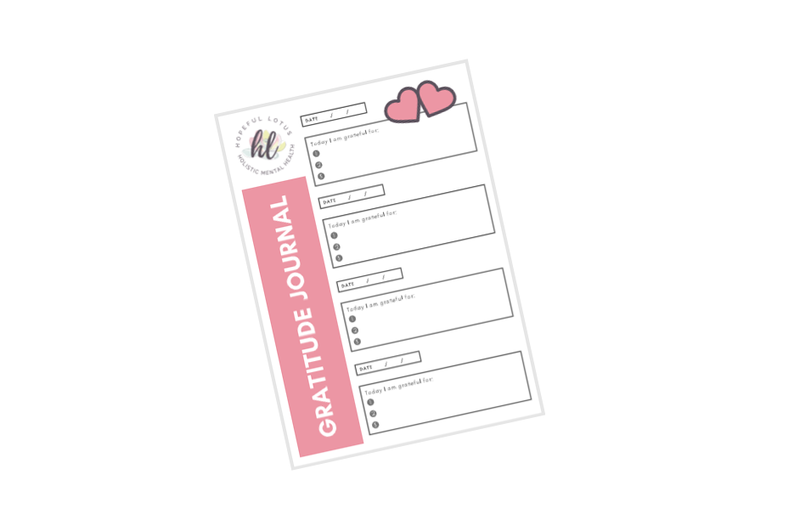 Try incorporating methods to reduce your overall stress levels and your gut will thank you! Practicing yoga and meditating regularly has been shown to have a positive affect on stress levels, which can take the strain off of your gut. Poor sleep hygiene can result in reduced immune function, higher levels of inflammation and an increase in gastrointestinal conditions. It’s in your favour to get at least 8 hours of beauty sleep each night to ensure your mind and body can function as they should. Getting your gut back in balance can be hard work. The bacteria in your gut can be incredibly stubborn when things are out of whack. Taking the right supplements could give you a helping hand in healing your gut and mental health. Want to learn even more? Check out these gut brain connection books!